When you’re writing a tattoo blog, you need to do the best that you can at keeping up with the most recent news that exists within the tattoo world. Sure, makes perfect sense, right? Well, sometimes there isn’t a lot of news to be shared and sometimes, the news is just as simple as a dude with a lot of tattoos. 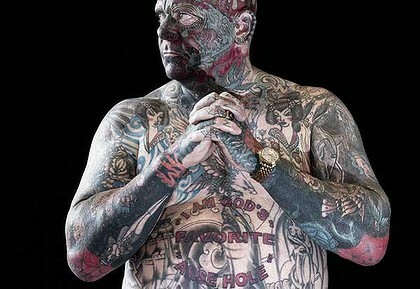 Yup, that’s what I’ve got for you to start the week off: a dude with a lot of tattoos. In all seriousness, Australian Tony “The Face” Cronin is pretty old school. At age 54, Cronin has made a life out of covering his body with tattoos, having received his first tattoo – a skull with the number 13 – at the age of 13. And he’s still not finished what he started so many years ago. ‘Tony reckons he has spent at least ”half a house” worth of money on his body so far and hopes that in another year or so he will be completely covered. It certainly is an achievement to spend that many years and that much money building up your tattoo collection, working toward a point that you had so long ago envisioned for yourself. And while I wish Cronin all the best of luck in completing his tattoos, I also think he should reconsider his current opinion about other people’s tattoos. ‘Tony hates the tattoo culture of today. He thinks it’s a craze gone wild. Aw, come on Tony. It’s not all that bad, is it? I think that if anyone takes the time to find out, they’ll see that there are plenty of stories behind most of today’s tattoos. In fact, I’d be willing to bet that there are more stories behind the tattoos of today than ever before. Call me crazy, but judging from what I’ve seen, it’s the truth.